Each spring, Orchid Trees put on an amazing floral show all over town! 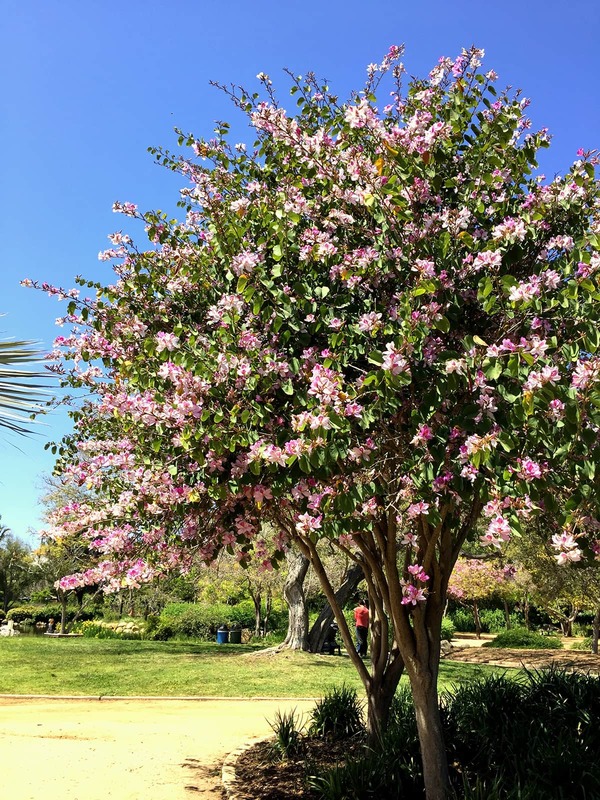 For this reason, Santa Barbara Beautiful has chosen them as their current Tree-of-the Month. When people see Orchid Trees for the first time, they find it hard to believe that any tree could be covered with such beautiful, orchid-like flowers. The flowers also have a wonderful fragrance. In addition, they have distinctive, double-lobed leaves that look like butterfly wings. Orchid Trees are not true orchids; they are actually legumes – and related to common peas and beans. Being small- to medium-sized, they can fit into almost any landscape. Being beautiful in flower and leaf, they are much loved and often planted here. All Orchid Trees are species in the genus Bauhinia. 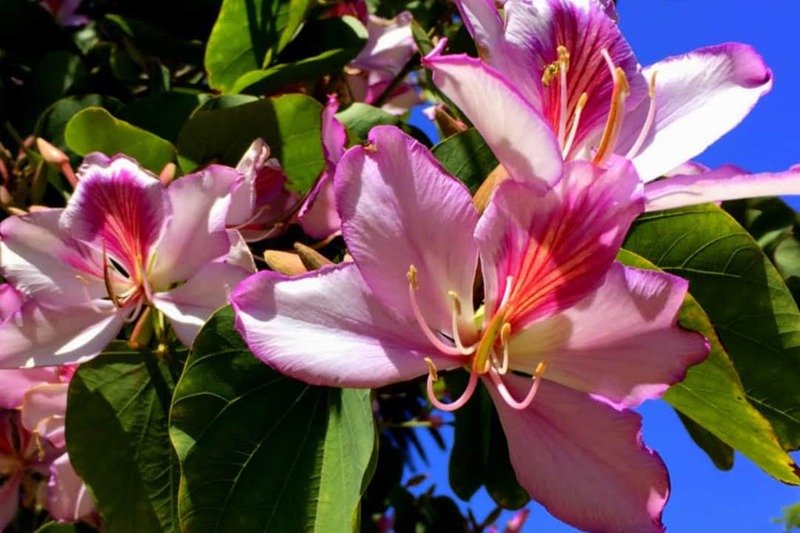 In Santa Barbara, three species can be seen: the Lavender Orchid Tree (Bauhinia variegata); the Hong Kong Orchid Tree (Bauhinia blakeana); and, the Brazilian Orchid Tree (Bauhinia forficata). However, they are not indigenous to our area; Lavender Orchid Trees and Hong Kong Orchid Trees are native to Southeast Asia, while Brazilian Orchid Trees are native to Brazil, Argentina and Peru. They all do well in our Mediterranean climate, and are fairly drought tolerant after they are established. Lavender Orchid Trees are street trees in the 700 and 800 blocks of Olive Street, 100 and 200 blocks of West Islay Street, and in the 400 block of East De La Guerra Street. Outstanding individuals are found at the northeast corner of Carrillo and Garden Streets and in the City parking lot in the 1000 block of Anacapa Street. Now is the time to go out to see Lavender Orchid Trees, since they will be at their peak bloom for the next couple of weeks. Hong Kong Orchid Trees are street trees in the 100 and 200 blocks of East Padre Street. Notable individuals are at the southeast corner of the County Courthouse and at the southwest corner of De La Guerra and Olive Streets. Both Lavender Orchid and Hong Kong Orchid Trees are street trees in the 800 block of Spring Street. The Brazilian Orchid Trees are street trees in the 600 and 700 block of State Street. They will have white flowers in late summer. All three species have been planted in Alice Keck Park Memorial Garden. Enjoy them all in one place! Santa Barbara Beautiful has initiated the Tree-of-the-Month article as a way to increase awareness and appreciation of Santa Barbara’s many outstanding public trees in conjunction with their ongoing program to fund tree planting along the City’s streets, which has resulted in the planting of more than 12,000 trees to date.